When I got an email announcing an exclusive from NBC about the raid that, we’re told, resulted in the death of Osama bin Laden, I dared raise my hopes. The last time a major media organization, the New Yorker , had promised us the inside story about what really happened on that day in early May, 2011, we got a major bit of disinformation . But, being an optimist, I set my TV to record the hour on NBC’s newsmagazine show, Rock Center, and went out to dinner. When I returned, I settled in and began watching. I heard the dramatic music, and listened to correspondent Brian Williams’s dramatic intro. Then I began waiting for answers. I waited. And waited. The answers never came. Can you believe an entire hour (or about half an hour plus endless ads) and not one interesting revelation? Can you believe that almost the entire thing dealt with how people in the White House felt that day, what kind of chairs they sat in, etc, and almost nothing on the details of the raid or the disposition of the body? Even the details that sounded vaguely interesting, like the fact that the chopper that crashed was some kind of new, secret craft, were already known long ago. 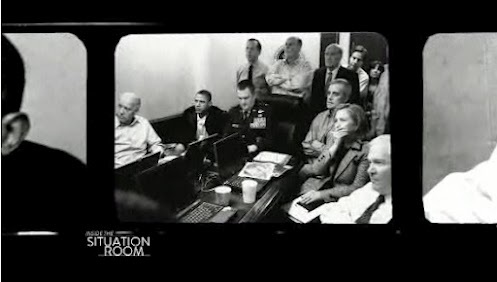 I got a feeling that the whole thing had been carefully rehearsed, and then I thought: Why would the White House give NBC an exclusive, “first-time” look inside the White House Situation Room? Well, in part because it’s just a room with chairs and flat screen TVs—absolutely nothing interesting. But why even offer this purported exclusive insight into the raid? Because it was nothing of the sort. Because it was propaganda to make these people look good, to quell reasonable doubts about what really happened that day, and to get the president and his team re-elected. Did you see Williams asking any of the scores of questions one might ask: about how no one in that crashed helicopter was hurt; about whether Osama was armed, and if not, then why he had to be killed instead of captured and interrogated for the valuable information he could offer; about how and why the SEALs’ headcams purportedly failed at the critical moment and prevented the White House group from seeing what was going on; about why the body had to be thrown in the sea—and before proper DNA verification was possible; about the wildly conflicting accounts of what took place and the White House’s failure to this moment to explain; about…I could go on and on. But we’ve already laid all that out—you can read those questions here . Probably the only interesting thing in the entire report was that Vice President Biden fingers a rosary bead when he’s nervous—or maybe that they ordered in pizza while waiting for the raid. Oh, and one more lesson—that all those people must think we’re really, really, stupid. Hope NBC reports this as an in-kind donation to the Obama campaign.